When considering the best home multi-gym to buy, then you will need to think about the features you are going to need. Fortunately, The Mountain Fitness Multi-Gym Tower Station from Klarfit is a versatile muscle-building piece of equipment that not only looks great, but also provides multiple strength training options and fitness solutions. This home multi-gym has lots of features for beginners and the more advanced weight trainer, this range of features enables a highly varied workout and provides an excellent amount of exercise options, making The Mountain by Klarfit one of the best home multi gyms to buy. The Mountain multi-home gym is built with reliability in mind, and the solid metal construction has a 100kg max load-bearing capacity and provides a maximum 45kg weight stack. The upholstery is covered in black faux leather and is easy to wipe off and clean after your workout. The foam padding provides a comfortable workout while at the same time providing excellent support, which enables you to workout with the correct form and posture. The multi-gym’s ultra smooth-running plastic-coated steel cables ensure smooth movement allowing maximum power transmission and providing joint-friendly weight training. The Mountain Home Multi Gym Tower Station also features ball-bearing guided rollers, which allow a graceful muscle workout as you move through your repetitions. The Mountain from Klarfit is a reliable fitness station and gym bench, and the stable metal frame allows for multiple muscle exercises, targeting muscle groups in the arms, legs, chest, and back. Indeed The Mountain Multi-Gym provides a superb rounded strength training routine, which enables you to progress your goals steadily but surely. At the centre of this muscle & fitness workstation is the butterfly module, used for both chest and shoulder exercises. Work your upper body muscles including your pectoralis major and minor muscles, focusing on your inner chest development. You can also work your biceps & triceps, lat, and back muscles with the latissimus option and you can simply blow up your lats, with exercises such as the overhead pull-down or seated row. The seated row can also be used to strengthen your shoulders, back and arms. The Mountain Home Gym comes with cable devices, which are suitable for working your biceps & triceps as well as performing back exercises while in a standing position. The cable function allows you to target the main bicep muscles. Performing pull downs to your front will work more of your lats and teres major muscles while behind the neck pull downs will target your inner back muscles such as the rhomboids and lower traps, as well as your lats. What makes The Klarfit Mountain Tower one of the best home multi gym exercise stations is the ability to perform the bench press. The bench press is superb at working a variety of muscles including your pecs, deltoids, and most muscles of the upper body. There is also a leg extension device, which is fantastic for working the front leg muscles including the quadriceps, sartorius, and rectus femoris muscles. You can also use this multi gym to perform challenging leg exercises when the leg strap is mounted, or use the leg curl device on the rear leg section. If you’re looking to purchase gym equipment for the home, then The Mountain Fitness Multi-Gym Tower Station is one of the best versatile fitness stations that you can get. With the lat tower, butterfly module and hand and foot cables, this home multi gym comes with enough options for a wide variety of strength training exercises. Work both your upper and lower body muscle groups as you power through your fitness goals with ease. Klarfit has certainly excelled with both style and functionality with this home multi-gym system. 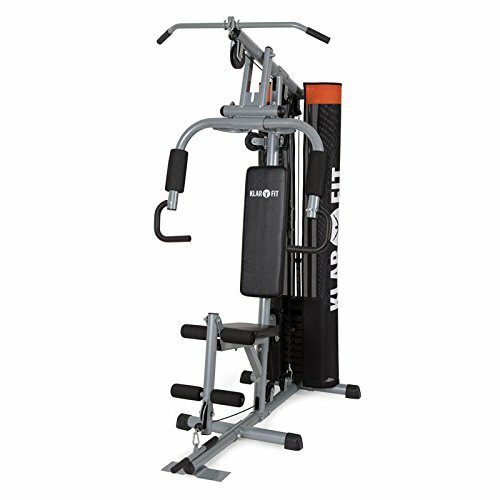 Build stability and strength by using the correct form and technique on this solid, well-built gym machine. Please note that the item is shipped as an assembly kit.